First off, I am just back from a short trip to Germany, Finland and Estonia, and I have been surreptitiously consuming large quantities of chocolate filled with Finlandia vodka. So if this post seems a little, well, highly vague, you know what to blame. Legend has it that Lord Rama was humming Karaharapriya while he was returning back to Ayodhya from the South. As he reached the gates of his palace, he had gotten tired of the raga, and once in a while casually dropped the “pa” thus occasionally suggesting shades of Shreeranjani. And that is why North Indians traditionally drop the “pa” in Deepavali as a tribute to this display of musical carelessness. Of course, I just made that up. Today is Deepavali, and the while the asuras will mourn the death of their hero, Narakasura, killed by what they will claim to be rather a unethical trick, most people in the South will be busy bursting crackers, hogging sweets, transferring their life savings to cloth merchants in T Nagar, and eating Deepavali Marundhu (Home made Chyavanpraash, that my grandmother used to refer to as Syavanapragaasam) to digest it all at the end of the day. As we travel north though, the Deepavali legends traverse across avatars as well, but in reverse direction. So Krishna:South => Rama:North. But wait, we are missing a step in between. So perhaps there should be a Balarama legend in Madhya Pradesh, so we can have this nice inverse relationship between avatars and Indian geography with respect to Deepavali legends. In the North, Diwali is celebrated a day later, because Lord Rama did not call Scotty and tell him to “Beam me down to Ayodhya”. He is said to have borrowed Ravana’s private jet, but I have my doubts. Flying direct to Ayodhya would have taken only a couple of hours, not an entire day. So my guess is that they took the jet to Delhi, and then took the train to Ayodhya, because that place lacked an airport (I believe it still does). Now Sikhs, being generally more astute than the average North Indian, realized that Lord Rama was actually singing Karaharapriya and not Shreeranjani, and decided to bring the pa back, and that is why they call themselves Paajis. Additionally, it turns out that it was on this auspicious day that Emperor Jahangir released Guru Hargobind Ji from prison in the Gwalior Fort. So they celebrate Diwali too. Among other legends, it is also the day Mahavira smelled some teen spirit. But the spirit of Deepavali is global. Mythology aside, even Luke Skywalker and Frodo Baggins were deliverers of light. After all, Luke and his band proved that a thousand bijli vedis are more powerful than one big spherical Hydrogen bomb, and Frodo managed to drop Sauron’s Lakshmi vedi into a puddle of water. But while the idea that light triumphs over darkness is universal, recent developments in physics are threatening to um..well..do the sort of things to this idea that black holes do to matter. Apparently, most of the universe is pretty dark, what with dark energy and dark matter being more common than good ole’ light and regular, touchy-feely matter. It’s almost as if the universe began with a totally grand Deepavali, and I mean, a singularly (wink wink) big Deepavali, and then pretty much decided to go dark from then on. It’s like someone said “Come to the dark side, Luke”, and the universe said “Oh well, alright”. As Nostalgia Inavardaysanathan Mama often used to say – “In our days, there used to be so much light, but today’s youngsters (young stars)? I see no hope for them in the (event) horizon”. Little did I realize then that his daily complaints about the youth had truly cosmic references. But let not Darth Universus cast a shadow on the happy festival Deepavali truly is. There is a lot to be learnt from this festival despite all the gloom and doom in the global economy (and in the universe in general). Perhaps we all need to learn from the ecological prudence of young, not-so-privileged children in Madras who will salvage the chemical mix of unexploded Deepavali ordnance to make their own crackers. Have a joyous, safe and environment friendly Deepavali. 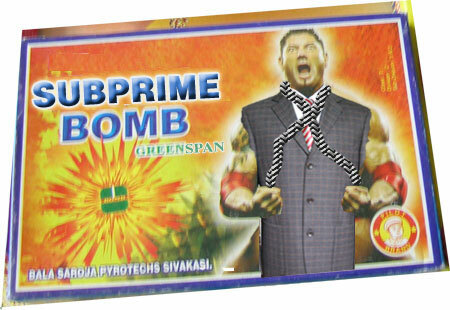 ‘O’bomb’a Garland’ should have been another product from Sivakasi, what with Obama’s threats of bombing Pakistan! Or ‘Nuclear Deal 2008-wala’! ROFL @ the innovative names of fireworks! Who else could have come up with such names! Lovely! Absolutely loved the Kharaharapriya and Sriranjani reference! Happy Diwali to all denizens of the blogworld. At least ppl have yet to give a true explanation to why Diwali is celebrated one day ahead here in south. never knew that there was some reason behind the delay.. May be they would have taken a break on the way from south to the ayodya..
” Subprime Bomb ” poster was fantastic. I want the McCain – Palin Double Shot! 😀 Is there a Obama Atom Bomb as well? Wonder why no enterprising ‘bull’ sivakasian came up with the ‘Dow/Nikkei/HangSeng/BSE/NSE Rockets’ – guaranteed to go UP as well asDOWN! P.S: Is the PA in Jilpa also an effect of the Sreeranjani? P.P.S: Whats the explanation for the Caesar-esque post title? If this is how you are going to write after eating Vodka filled chocolates, then please have one serving before and after you blog each time 🙂 Well atleast the image is better than a random female dressed in saree that used to come in those days. Dang! i thot about it while writing mine, but then decided to shelve it. Man it seems so cool wen I read it now…. Hehe… what if Rama came down south humming Kharapriya and missed out the Nishadam, would that be Abhogi? Hmm, can’t find a connection between this, Tamrabharani and Deekshitar’s Srilakshmivaraham. Okay, happy deepavali (with the pa) and safe vedichifying, and all that. Venaikku vedikkada, machi. haiyya! bijli vedi! thank god SOMEONE mentioned that.. they used to be my favourite! from finlandia vodka to subprime to event horizon, i smiled and smiled ! not to mention the Ravana’s private jet morphing to RamJet; which you didn’t. thank you for the lovely ramble. you are a talented wordsmith with the right dash of, pinch of, the secret happy ingredient. creative wordsmithing is alive and well in you. the wonderfulness is all the disparate references blended in, but first twisted like balloon animals to a custom shape to fit your amazing point of view, your hindbrain’s reality… thank you so much for sharing ‘the world according to krish ashok’. in someone’s famous words to someone else, sometime, “keep it coming”. Kudos! I am sure that you have heard this so often that it passes off more as a cliche now, but this blog is truly inspirational! Happy Deepavali ( south indian only pa!!) to you too…. Thanks for the consistently great content! Happy Diwali from Helsinki! lol! this was one crosscountry pop (or pa-p? paap? err) history lesson. happy diwali to u too. So the day before deepawali should be the day on which sita was asked to prove her “purity” by entering fire, right? where are all the feminists? “Arrey, Ram had to come through the south na, to reach Ayodhya from Lanka, THAT’S why”. krishashok: i love your blog, even though i sometimes depend on an army of maamas to translate it for me. but why the persistent snipes at poor amit_123s of the world (a little too thackerayish sounding methinks)? a little ribbing is ok. hell, we even deserve it sometimes. but your scythian cousins need some tlc these days; kindly oblige. in any case, my sugarappa and i thank you for the good work. Oh, finally I get a plausible explanation for the pa or lack of it…. it bugs me every year… and the jet lag between south and the north. Yes, more vodka-filled chocs to you KA! Deep! Now I know where that pa went. I recently stumbled upon your blog and landed on the Himesh Reshamiyya post. Ever since, I have been reading quite a lot of your posts and am thoroughly enjoying reading every one of them. Just wanted to say that I love your blog and you have a new fan.. Happy Divali to everyone (better late than never)… Check out my song on YouTube about travelling in India. The lyrics are in English, and a little bit Hindi. Especially the paragraph on the Big Bang and the co relation to brahmin mama complaints, simply superb!